Eggs are versatile and nutritious, and at Waitrose we no longer sell eggs that come from battery hens. Treat the family or guests to this classic egg dish. Serve it as a brunch with plenty of sliced, buttered soda bread. Preheat the oven to 190°C, gas mark 5. Butter the insides of four 200ml ramekins or ovenproof teacups and set in a roasting tin. Pour boiling water in the tin to come halfway up the ramekins or teacups. Mix together the cream, parsley and seasoning. Pour half the cream mixture into the ramekins then carefully break an egg into each one. Pour the remaining cream on top and finish each with a dot of butter. Bake for 10-12 minutes until the eggs are softly set. Serve with sliced and buttered soda bread. Please note: because this recipe contains semi-cooked egg, it is not suitable for the very young, pregnant women, elderly people or those whose immune systems are weak. 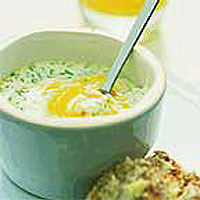 Add 50g chopped smoked salmon to the cream, or sprinkle each cocotte with some crisply grilled bacon, crumbled or chopped.